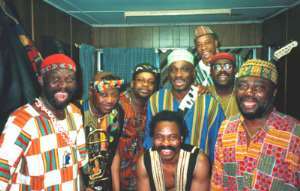 Mack Tontoh of Osibisa fame has thrown his weight behind the NDC. It now seems fashionable in Ghana that everyone wants to be associated with the NDC. Mack Tontoh is putting together a couple of jingles to be used by the NDC campaign team most likely based around the term 'Scent nu'.